Company co-founder Lou Pantalone, of Hammonton, right, looks in at a group in the conference room, Monday, at Univers Workplace Solutions in Hammonton. 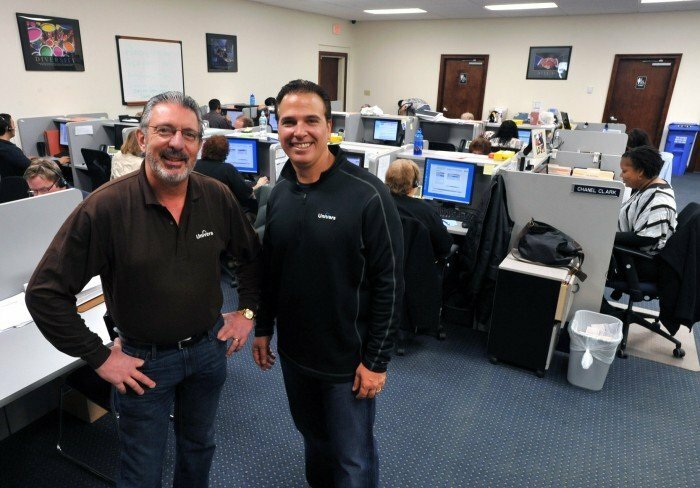 Founders Lou Pantalone, left, and Greg Morano, both of Hammonton, stand in a call center Monday at Univers Workplace Solutions in Hammoton. 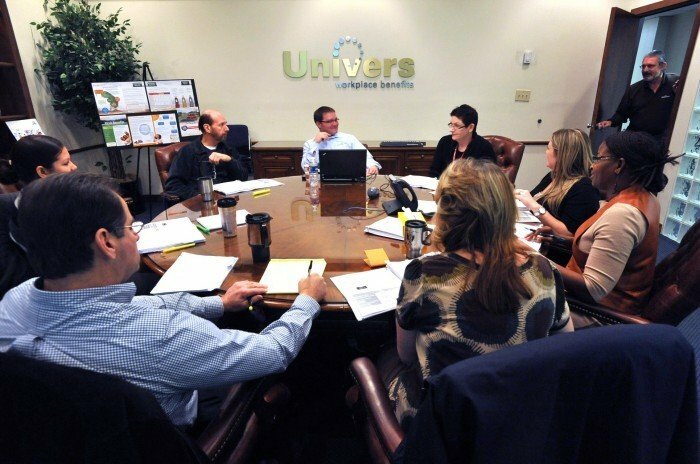 Univers Workplace Solutions, the employee benefits administration powerhouse headquartered in Hammonton, is a great example of how the success of one industry can create an opportunity in another, seemingly unrelated area. Univers, a Goldman Sachs Capital Partner company, has more than 1,200 full- and part-time employees serving the nation through centers from Florida to California. Among its clients are Radio Shack, GameStop, Perdue and Pilgrim’s Pride, and despite the downturn Univers has had double-digit growth the past two years, CEO and President Greg Morano said. But in 1991, Univers was just two guys — Morano and partner Lou Pantalone, both of Hammonton — who had worked for Prudential helping Atlantic City casino hotels administer group benefits for their massive work forces. There had to be a better way, so Morano and Pantalone developed one, reducing paperwork for HR departments while communicating more effectively with employees. With work forces in the thousands, the casino companies were the perfect laboratory for learning how to communicate effectively about employee benefits to very large groups. The Trump properties and Borgata remain among Univers clients. Communication is the first pillar in the company’s successful strategy of targeting companies with 1,000 employees or more, Morano said. Research shows three-quarters of employees will appreciate their benefits regardless of the plan if they understand those benefits, he said. Given the best plan in the world, one fourth will appreciate its benefits only if they understand them. “So if employers don’t communicate effectively, they could be wasting a lot of money,” Morano said. Univers creates custom campaigns with multiple channels — online, printed materials, social media and in person — to educate workers about benefits. The firm’s proprietary myUnivers platform likewise uses face-to-face meetings, call service centers and online access to give workers a wide range of enrollment options. Univers then offers administration services built around an online platform to oversee benefits, life management, data integration, carrier fees and audit trails, he said. Well-run benefits education, enrollment and administration boosts employee retention, critical in an age of benefit reductions. The acquisition of Univers by Goldman Sachs Capital Partners in 2007 put the company on the path “to the scale we want to get to,” he said. At this busiest time of year for Univers — with most plans having Jan. 1 renewal dates — there are 120 full-time and 350 part-time staff in Hammonton (the latter typically working seven to nine months a year as benefits counselors), he said. One full-timer in Hammonton does nothing but focus on health care reform, working through contacts in Washington to track its daily changes, he said. “Health care reform is still the great unknown, but we’re ready for it and our clients are ready for it,” Morano said.